Particularly ironic about their complaints is the fact that three of the languages being sung were being spoken in this land called America for centuries before the arrival of English-speakers. Of course this irony would be lost on people who seem only to be intent on something to complain about. They missed the entire point of the ad (besides selling soda) while they were busy spouting their vitriol: that the American ideal is people coming from all over to fulfill their dreams, being welcomed with open arms, and working together to create a great society. Or at least that's the drivel I was taught in school. Of course, growing older, I learned the truth: there is no equal playing field. Native Alaskans, Hawaiians, Native Americans, and Mexicans were driven off their land, or forced into slavery to benefit white masters. Africans were shipped here for similar purposes, and worse. Immigrants have historically been given the hardest, dirtiest, least respected jobs, while being blamed for crime rates, treated with suspicion, and persecuted. It happened with the Chinese, the Irish, and now the Mexicans. And God forbid someone move here from the Middle East, because that entire group is automatically assigned the title of "terrorists," by the same group invading, occupying, droning, and bombing the rest of the world. But I digress. This ad could serve as a reminder of our common humanity... make us all want to try a little harder... to sing the same song, to be a team? I would like to believe more than soda unites us, things like freedom and equality. Apparently this group of Einsteins does not agree. "Get over it. The world does not 'belong' to English-speaking white people. Nobody is hurting you by singing a song you like in another language. I know it may be hard for you to believe, but there are wonderful, intelligent, thoughtful, kind people everywhere who don't speak a word of English. You are not superior. They are not inferior. It's not 'un-American' to show real Americans from another culture singing in a tongue you don't understand, just because they don't look and sound like you. You are not 'more' American than they are. People like you are the reason that people all over the world think Americans are stupid. You don't speak for me or any other intelligent, thinking American. Lastly, grow up." When I saw this commercial I loved it. Thought them using different languages did represent the fact this nation is made up of people from so many nationalities. Had no idea there was an uproar over it however. Go figure. Some can be such idiots. Not having watched the super bowl, but seeing such a big hullabaloo rise about up this ad, I had to look it up on youtube to see what the fuss was all about.... I watched and listened to it 3 times... each time wondering what I was missing. Why was this beautiful thoughtful song being put down? I still don't get it. This is a beautiful song, beautiful scenery, tastefully done, about the melting pot that is America. 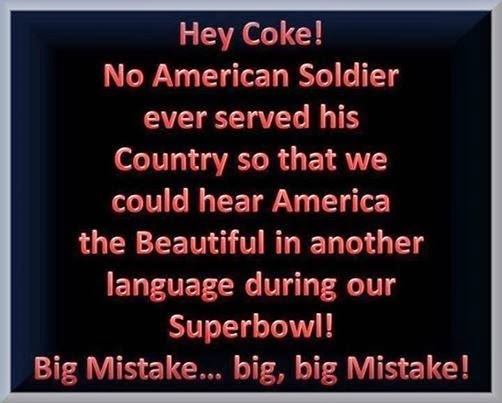 This is NOT our national anthem, so I see no problem with it being sung in many languages - the story is still the same - the story of America the Beautiful - in any language. I also noted the 3 or maybe 4 languages ( I wasn't sure) that were here before English was spoken.... Technically maybe this song should be sung in a Native American dialect to be culturally correct - for they were singing praise about this mother earth long before the other languages should up in America... yet I don't hear them raising a stink about in being sung in English.... Geez, folks... get a life. Enjoy this melting pot that is America - enjoy her many cultures - enjoy her many languages spoken and the beauty of them. Enjoy this beautiful ad and song of JOY ! I've always liked this song considerably more than the national anthem, and felt it would be a great national anthem. To hear it sung in all these different languages just deepens its meaning. I found it inspirational! Ramy is right...this should be our National Anthem.